Are you in the midst of the annual August Zucchini Storm? No worries, this recipe for bet-you-can’t-each just-one zucchini chips is here to rescue you…and to provide some heathy snacking deliciousness along the way. All you need is an oven, something to slice with (more on that later), some olive oil and salt and your oven. Oh, and a zucchini. Ready to give potato chips a run for their money? Let’s make it!First, the slicing. You want these babies to be nice and thin so that they cook up to the right amount of crispiness, and for that I use my mandoline slicer. Here comes my very serious reminder to be VERY CAREFUL when using one of these babies, because they are all kinds of sharp. But they are perfection when you need super thin slices of anything. Once you have your zucchini all nice and sliced, press the slices gently but firmly between two paper towels. The idea is to get them as dry as possible before we bake ’em up…again, for maximum crispy. 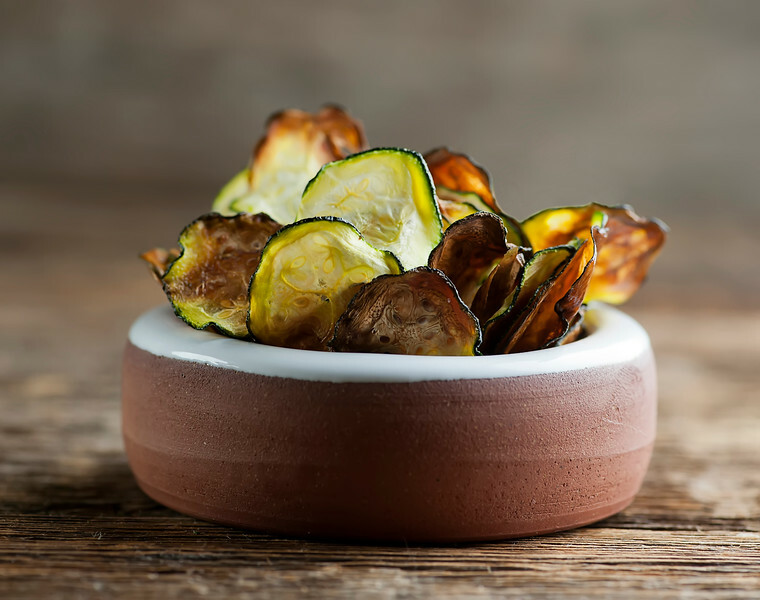 Line a baking sheet with parchment paper in a single layer (if you have a big zucchini you will need more than one tray, which is fine because MORE CHIPS FOR US. Brush them with a super light coating of olive oil and sprinkle them with a teeny bit of salt (you can always add more salt later, but you can’t un-salt, so less is more here at the beginning. Pop them into a 300 degree oven for about 30 minutes. The idea is to get them nice and brown…that’s how you know they are crispy. Check them after about 20 minutes just to see how things are going in there in the oven. Once they come out, you aren’t going to want too much time to go by between the cooking of them and the eating of them…they are scrumptious, but they don’t keep well. Which is not a problem in my house, since we pretty much devour them as they come out of the oven. So, take THAT, zucchini storm…bring it! Preheat oven to 300 and line a baking sheet (or two) with parchment paper. Slice the zucchini into very thin slices (a mandoline slicer works best for this – remember to be careful!). Place the slices between layers of paper towels and press firmly but gently to blot any liquid. Lay the slices in a single layer on the baking sheet. Brush lightly with olive oil and sprinkle with a little salt. Add more salt if needed and enjoy at once! I tried to make zucchini chips about two years ago… they were a burnt mess… I have to try it again, they look so good and I am sure I would love them. I have some zucchini in the fridge and I am SO doing this! I’ve made breaded zucchini chips before, but never a version like this. LOVE this, Kate! Sounds like such a delicious snack to cure those afternoon cravings! I had found a recipe for zucchini chips that required they bake in the over for FOUR hours…which is not exactly what I want to do in the dog-days of summer. So glad to have found this one which only requires an hour or less of oven time :) Also, could they be lightly oiled by a spray with Pam? And what happens if not eaten right away – they get chewy? I haven’t made zucchini chips in quite a while Kate! Thanks for the reminder! These look great! I have to try it this week, they look so delicious and I am sure I would love them. Thanks for sharing!